In the next few weeks scientists will smash 2 atoms together. This could be the end of the world from the cause of a black hole, or this could unlock many mysteries that could tell us more about our universe and some say even cure cancer by revealing the more information about subatomic particles. "When the beams collide head on, they will create fireballs and showers of subatomic debris never witnessed before. Dr Varvell said the impacts could produce man-made mini black holes, reveal that the universe has extra dimensions that are normally curled up, and throw light on the nature of the mysterious dark matter which makes up most of the cosmos. 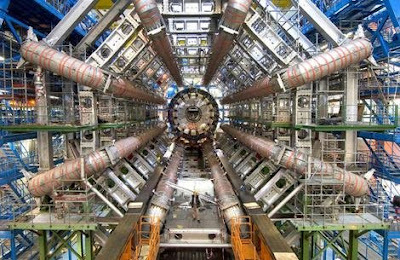 It should also reveal whether the Higgs boson, or God particle, exists or not." If you haven't heard about the story of the Atom Smasher, checkout this clip. Now no one will live to find out if the Franny and Freddie bail out was actually a great idea. I don't think that many people even know about this experiment. Science isn't mainstream. I guess you are right! BTW, I added you on my blog roll if you don't mind. Thanks. PS- MPT, almost sounds like HPT. >>PS- MPT, almost sounds like HPT. I know - I did that purposefully to gain some attention ;). Just kiddin! I've been following this development off and on for the past year. It's amazing, scary stuff! When the first atomic bomb went off scientists were unsure whether the blast could keep itself contained, or whether it would keep building on itself. They still decided to fire it up. Balls of steel.